Mrs. Smith’s class made a line plot to show the amount of sugar that each student consumes in a given day. 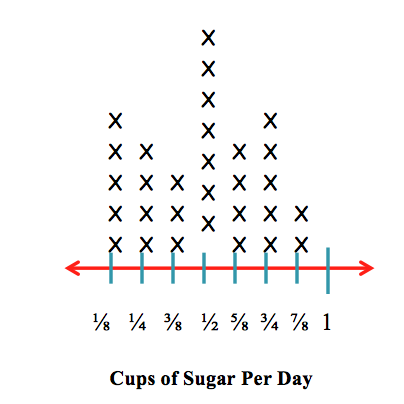 How many students consume cup of sugar? Each X represents one person. There are Xs above the tick mark on the line plot. Mrs. Smith’s class made a line plot to show the amount of sugar that each student has in a given day. How many students have cups of sugar? How many students have or cups of sugar? To solve this problem, we have to add the number of Xs above the tick mark to the number of Xs above the tick mark. There are Xs above the tick mark and Xs above the tick mark. How many students have of a cup of sugar? 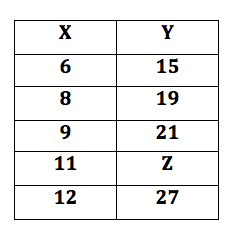 If you are faced with a chart and a missing number, you need to figure out the pattern in the pairs that are shown. If you think you have discovered the pattern, make sure to test it on each known pair and test if it is true for every pair. The table below gives the number of students who scored in each of five ranges on a standardized test. No student scored below 51. What percent of the students scored 71 or better (nearest whole number)? More information is needed to answer the question. Now add the number of students who took the test. 67% of the students scored 71 or better.